Bauman holds a 30 year old showing Bill Bauman, Jeannine Bauman, Ed Cron and Irene Cron. VIRGINIA — He’s had a Harley-Davidson and a golf cart in the chapel; The Rolling Stones and AC/DC background music at visitations; funerals on the lake and in a bar. His casket room is now a coffee lounge. “I was an embalmer. Now I’m also a Facebooker and a web manager,” says Bill Bauman. Personalized funeral services, 24-hour casket delivery, and technology has reshaped the way people honor the loss of loved ones — and the duties of morticians like Bauman. So much has changed in the past three decades since he and wife, Jeannine — the true “boss,” he jokes — became funeral home owners in 1987. Oh, all the things a young 20-something Bill Bauman didn’t know when he got into the business. 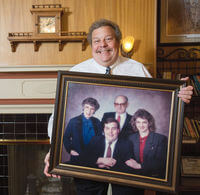 “I’m glad I didn’t know all that was going to happen,” the Bauman Family Funeral Homes owner and longest-serving funeral director in Virginia, whose business has three locations, says with his characteristic big smile and the hearty laugh. The good-natured end-of-life provider is as much known for his jovial spirt and the unexpected welcomed laughs his disposition prompts from grievers as he is for his great kindness and compassion. In fact, it’s part of his makeup to want everyone to be happy — not a real easy task for a funeral director. However, Bauman is not only referring the fact that a motorcycle and rock music is not out of place at a service these days, or the challenges of keeping a business running, or that posting to social media and updating a website is part of the job. Being a mortician takes a toll on a person. “Every time I do a funeral it takes a part of me,” he said. “It used to be that I was burying friends’ parents. Now I’m burying friends, and friends’ children and grandchildren,” Bauman explained. “I’ve been a grieving son twice.” First when his dad died in 1998 of prostate cancer that spread to his bones, and then when his mom died in 2015 of a botched surgery for a bleeding ulcer performed in another state. And nothing is as difficult as watching a family say goodbye to a young child. He and Jeannine suffered three miscarriages. And daughter, Erika, now in her mid-20s, had a rough start at life, born at just 26 weeks. “The effect a child’s death has on me...” Bauman says, wiping tears from his eyes. “Nothing good comes out of it. I hate it. I hate that it happens. It really gets me; it gets me here,” he says, placing his hand over his heart. The Kleenex box remains on the table in a front room of the old Virginia building, where the Baumans live upstairs — and the tissues come in handy for the funeral director as emotions surface while he condenses 30-plus years of chronicles into two hour’s time. A fresh pot of coffee is on; vintage plastic Solo coffee cup holders stacked nearby. Yes, “undertaker.” That term will do just fine, though it might not be as fancy or politically correct as mortician or funeral director, he said. Bauman is professional but not concerned about being fancy. He is not afraid to switch out a suit and tie with casual clothes when doing other work around the mortuary. The stereotypes of a mortician — “I’m here to blow them all out the door,” especially those of stoic and skinny, he says letting out a laugh. And how about a funeral director with a full head of curly hair? “It’s ‘chemo hair,’” he said, noting that lately he has received many double takes. Bauman can chuckle about it all now. And he kept his sense of humor through the toughest times — times when getting out of bed was a great effort. But the “cancer journey” has been an enlightening ride for a guy whose profession revolves around death. He was not prepared to hear terms like “life expectancy” applied to himself. He wasn’t ready to contemplate his own mortality after being diagnosed in April 2015 with prostate cancer. After all, “I have plans,” he said of the rest of his life. Surgery in August that year seemed to be successful. But the cancer would spread to his lungs, where 18 tumors had grown. Eight months of chemotherapy, however, had a substantially positive effect. The cancer is “treatable but not curable,” says Bauman, who receives infusions every three months. Sometimes in life you laugh until you cry. But other times, you “cry until you laugh,” he said. That’s about where he’s at now. And the already caring man has become only more so. “I’m not so quick to judge. Everyone is going through something,” he said. The fact that Bauman found his way to the funeral business is, perhaps, a sort of miracle of its own. Born in Virginia, Bauman spent his grade school years in Aurora and attended high school in Hibbing. Set on becoming a chemical engineer, the young Bauman enrolled at Michigan Technical University, where he tested out of his first year of college. All seemed to be going well, until Bauman realized his color blindness was a huge barrier in the field. So, Bauman began working construction. It paid the bills, but it didn’t fulfill his need to serve others. Unsure of what to do, Bauman sought the advice of a Hibbing minister, considering becoming a man of the cloth himself. The minister talked him out of it. “I have an innate sense that everybody has to be happy,” and his mentor said he would “never be able to make everyone happy,” Bauman said. About a week later, however, Bauman suddenly knew what he wanted to do. The funeral business involves chemistry, faith, and serving people. Bauman also enjoys theater and music, and there is some of that, too. Bauman took both of their advice to heart. He earned a bachelor of science degree in mortuary science, with minors in sociology, psychology, and criminal justice, from the University of Minnesota in Minneapolis. While at school, he worked for Werness Bros. mortuary, the largest in the Twin Cities. The experience was invaluable, and there his eyes were opened to all sorts of things he never considered, like how to cosmeticize a person of color. Bauman would return to the Range, where he landed a job managing the Cron Funeral Home in 1983. In August of 1987, he and Jeannine purchased the Cron Funeral Home and Northern Minnesota Cremation Service, which became Bauman-Cron Funeral Home. “By the grace of God,” Bauman said, he had found his place, and through the years the business grew. In 1994, the Baumans opened the Bauman-Vermilion Funeral Home in Tower, restoring local funeral service to that area after a 30-year absence. And in 1998, the couple purchased the Daniels Funeral Home in Hibbing, along with Greg Anderson, Jeannine’s brother, renaming it Anderson-Daniels. Although he appreciates book learning, “experience is the best teacher,” he said. “The face of the funeral service has changed.” It’s been rather dramatic, but yet, it’s still all about serving others, caring for people during their darkest moments. Bauman remembers when Catholic funerals were always at 10 a.m., Lutheran services at 2 p.m. The art on memorial cards had only a handful of choices: A crucifix, praying hands, a church window, maybe a few others. Obituaries were read over the phone to newspapers, and “you could expect to spend 15 minutes” on the line with each paper, he said. Now it’s all about personalization, from special venues to video tributes. Arranging a funeral is a bit like event planning, said Bauman, who has had services on pontoon boats, hiking trails, and yes, even at a bar. Cremation has become far more popular, and that makes funerals “more portable,” he noted. Ultimately, it’s his job to “listen and hear and try to provide” what a family wants. Funerals are held all days of the week now. But even back since Bauman was on call via radiotelephones and pagers, the time commitment has been a sacrifice. “It doesn’t matter if it’s Christmas or Thanksgiving. When that phone rings, you go,” said the funeral director, who works every other evening and weekend. That can be especially difficult on a mortician’s family. Tears surface as Bauman remembers one particular day when Erika was 6. The dad was driving his daughter down to a carnival, when he received a message that there was a death at home in Tower. “We had to turn right around,” he says. In the advent of online memorials, digital tributes and the trend Bauman sees of funeral homes making the business “a commodity,” he hopes some things aren’t lost. And the Bauman Family Funeral Homes received “an honor of a lifetime” in 1999, when it was awarded the national AfterLoss Award of Excellence by AfterLoss Inc., for its focus on providing after care to families. “This award reinforces our belief that we are not just funeral providers but transitional counselors,” states the funeral home’s website. And he feels blessed to share some of his positivity with others. Often people are mystified at Bauman’s attitude. “They say, ‘Your always upbeat.’” They wonder how that’s possible in his line of work. And families are many times a bit surprised when they find themselves able to laugh. “They say, ‘I never thought I’d be laughing in a funeral home,’” he said. “When my dad died, no one gave me an opportunity to smile,” Bauman said. That is important, too. He also believes in giving back. “Every time a person dies, it takes part of the community away,” said Bauman, who through the years has belonged to many civic organizations. He relies on his faith and his family to make it through the tough times. And lately he’s been thinking a lot about “how precious life is.” Suicides and homicides “break my heart,” he said. And, looking back, he remains glad he didn’t know exactly where the path would take him. He is still along for the ride. As long as the cancer stays at bay, he wants to enjoy every second he can. Bauman lets out a big laugh. “Hmm, that might not have gone so well,” he says. His grandpa died in a bathroom. Perhaps, he says with a grin, it’s also best not to know where the journey will end.